This EMT Basic Patient Assessment CEU Course is available as an online, self paced, distance learning (DL) course. The Self Paced EMT Basic Patient Assessment CEU lecture may be completed on the students own schedule. Students login, watch the lectures and then take an assessment exam over the material. Once the exam is successfully completed with a score of 80% or better, the student is automatically issued a certificate of completion. Multiple exam attempts are permited. You may apply this course to the NREMT required hours of NON-live continuing education. 1. Demonstrate an understanding of the rapid physical exam and the instances in which it should be used. 2. Understand the different conditions that can result in an altered mental status. 4. Describe scene safety and it's importance. 5. 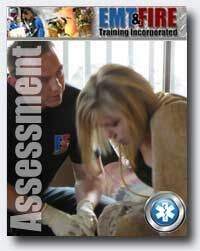 Demonstrate the steps necessary to complete a medical and trauma assessment.